The cultural exchanges between northern Renaissance artists and their Italian contemporaries are relatively well known – but what about medieval artists? A new exhibition at the Louvre-Lens Museum looks at how Tuscan artists of the 13th and 14th centuries were influenced by Parisian culture. Marie-Lys Marguerite and Xavier Dectot introduce the show. For some time, art historians have pointed out that Tuscan sculptor Giovanni Pisano’s style had some of its roots in contemporary northern gothic sculpture. But only recently has it been shown that this interest for gothic art was not specific to Giovanni but more widespread in late 13th- and early 14th-century Tuscany, and that this interest was mostly centred on Parisian art. The exhibition aims, for the first time, to compare Tuscan and Parisian works of art from this period to better understand how the stylistic transfer took place and how the Tuscan artists reinterpreted an art they probably knew mostly through small-scale objects, ivories, goldsmithery and manuscript paintings. Medieval exhibitions have often centred on national art, without examining the questions of international interactions and stylistic influences – apart from those going from Italy into Europe. For the first time, this exhibition will focus on foreign influences on Italian art. We will focus on the way styles can travel even when the artists don’t, in a time of urban growth and trade expansion. The exhibition will also try to reassess the status of the artist in 13th and 14th century cities like Paris, Pisa, Florence or Sienna, where sculptors, goldsmiths and painters were far more polyvalent than currently assumed and had a very high social position. The idea of the exhibition was born years ago, in the Museo dell’Opera del Duomo in Siena. Nevertheless, it was only programmed a year and a half ago and we have been really working on it since then. We – Marie-Lys Marguerite, director of the Saint-Omer museums, and Xavier Dectot, director of the Louvre-Lens Museum – are old friends and colleagues, and specialists of 14th-century Tuscany and 13th-century France respectively, so it seemed to us that making this exhibition together was a great opportunity. There are many. 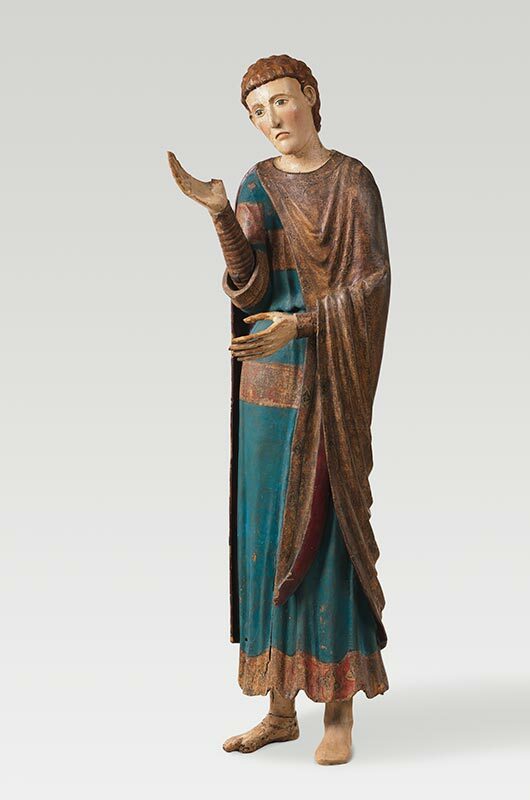 For the first time, a Christ from the Cathedral of Prato and a Virgin and a Saint John now in the Cluny Museum but also originally from Prato, will be shown together, allowing specialists to decide whether or not they come from the same group. 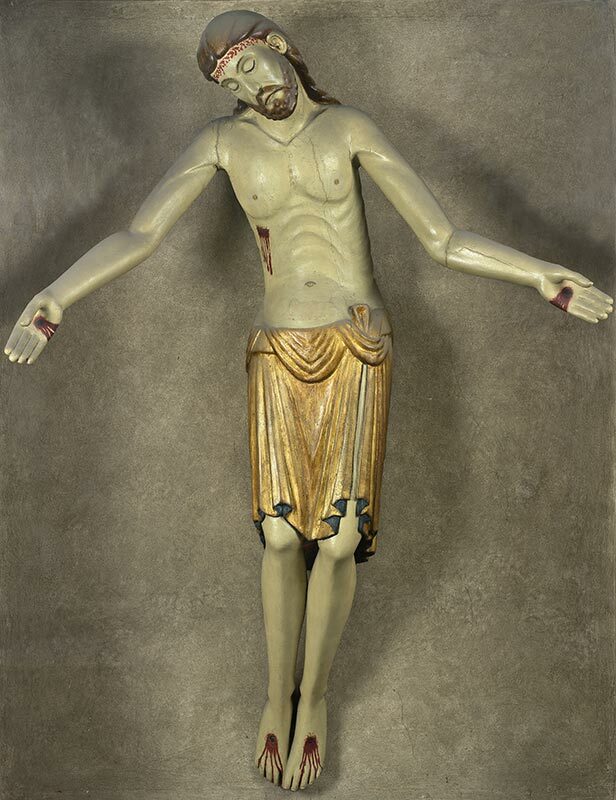 There will also be a unique comparison of pieces from around 1300 with stylistic links – among them a Christ by Giovanni Pisano, fragments from the St Gertrude cask from Nivelles or Maître Honoré’s La Somme Le Roy. A group of monumental painted sculptures from early 14th-century Tuscany will also help reassess the place they held in the creative culture of that time. There have been lots of them. We were, of course, convinced of the central theme of the exhibition, but every time we installed two pieces and saw how well they echoed each other – even when, seen separately, they seemed a little farther apart – we were more convinced of this central role that small objects played in the transmission of styles in these years. Bringing together pieces that often play a central role in their original museums is always a challenge. But the main challenge was that many key pieces are monumental works that are, in some cases, still in situ. So one of the great objectives was to be able to show the links we wanted while some of the main pieces were impossible to show. Another challenge was that late 13th-century and early 14th-century art was not only religious, but preserved pieces mostly are, so we tried to bring civilian pieces to light. We have a vast and versatile space. We are presenting monumental pieces alongside very small ones, so the challenge was to allow the visitor to go from one to the other, but also to be able to perceive the pieces in all their aspects – to show, when possible and relevant, the backs of three dimensional pieces, which, once again, the vastness of the space allowed us to do. Many monumental pieces still in place or, even when taken down, too fragile to move – such as the sculptures from the façade of the Cathedral of Sienna. 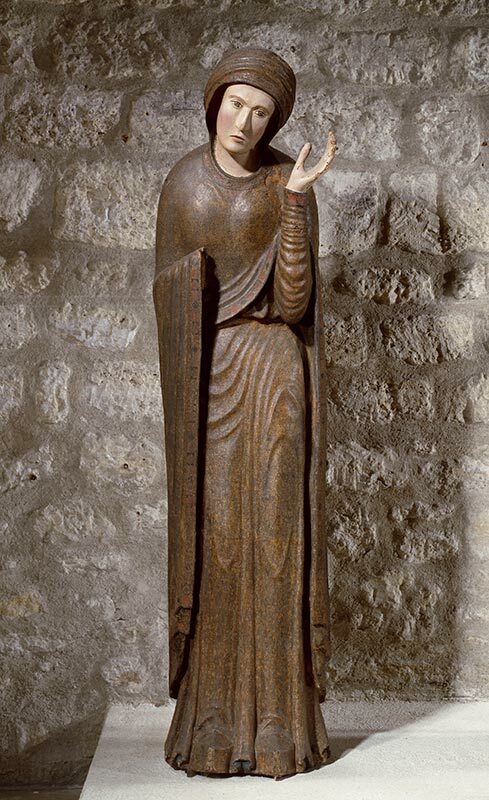 The Virgin from the north transept portal of Notre-Dame in Paris plays a key role in the exhibition, but it’s still in place, so we can only evoke it through a cast in the introductory section. ‘Gold and Ivory’ is at the Louvre Lens, Pas-de-Calais, until 28 September.